The Magical French Salad that Pairs with Red Wine: the Salade Landaise – GARGANTUAN WINE. 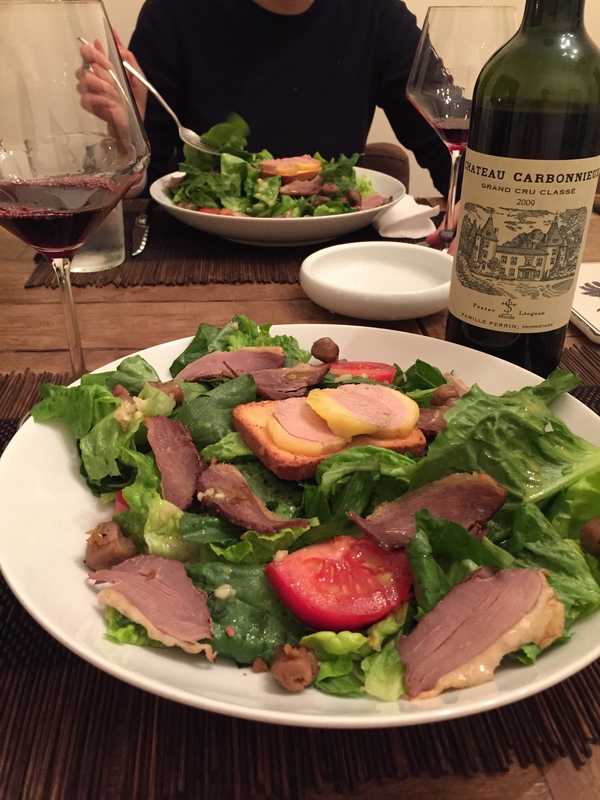 A salade landaise in Paris, complete with duck breast, duck gizzards, avocado, foie gras, and ... cucumber?! The perfect baguette and accompanying pâtisserie? Maison Kayser has me covered, and merely basking in the dining room’s din of native French conversations whisks me straight back to France. Truffles and scrambled eggs? Not happening here, to my knowledge; I may try to make that at home someday to accompany a stellar white Burgundy. The thing I miss most is the salade landaise, and sadly, that’s not happening anywhere in New York City. Imagine a salad with just enough meat and fats to pair with a bold red wine. But it’s still a salad. So you’re not crippling yourself digestively, and you’re not limited by, say, warm weather — salad is appetizing in all seasons. As the Landes region is typified by its pine-tree covered white sand beaches, many folks will include toasted pine nuts in their salad. 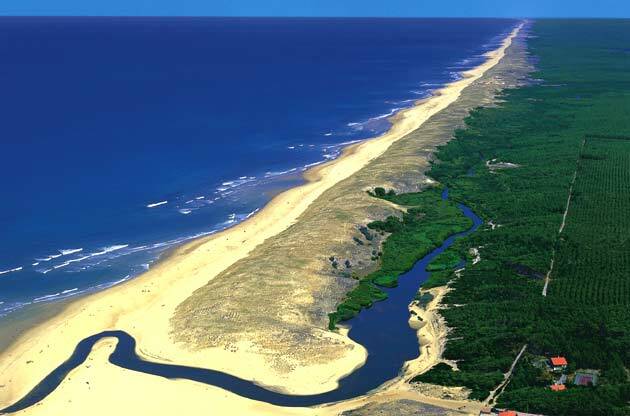 You have to traverse a pine forest before arriving at the Landes’ coastline. 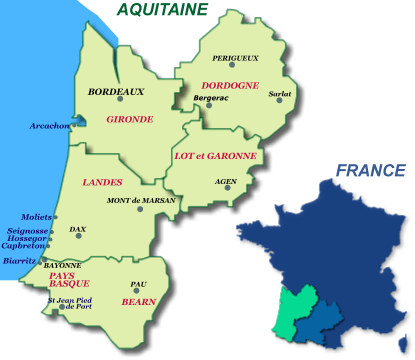 The recipe is obviously a specialty of the Landes region (just south of Bordeaux, and north of Bayonne), but the influence of my beloved Dordogne (around Périgord, which would technically make this a salade périgourdine) would insist on the inclusion of duck gizzards. I was going to teach folks how to confit their own gizzards in duck fat to then include them in the salad, but honestly, I tried it last month, and the gizzards came out tasting far too much like liver and we simply couldn’t bring ourselves to eat them. Too bad, as they are stunning in France. I do not believe in adding corn (gasp), cheese, Bayonne ham (you’ve gone too far south, folks! ), green beans, or asparagus as some other landaise do. Any number of passionate debates between locals ensue over the composition of la VRAI salade landaise. I usually can’t afford to include foie gras, and you can substitute avocado. The only store-bought foie gras in the US that tastes right is in torchon format around $35. Barring that luxury, for this to come out right, you need three essential taste elements: very thinly sliced smoke duck breast (the thinner, the easier you digest this very, very rich matter — get a butcher with a slicer to do this for you), a fatty element like avocado or perhaps foie gras, and genuine sherry vinegar or good balsamic. It’s tough finding bright red smoked duck breast here in New York City; most often, it’s a bit more greyish color. Please message me if ever you are able to find the above ruby fresh quality. Aside from the fact that this recipe is bonkers, jaw-droppingly delicious, it’s also a way for you to eat salad while drinking Bordeaux reds. And that’s just Bizarro-world weird to imply one’s eating anything but a red meat while drinking that wine. In essence, you cheat by only perching a few extremely potent small portions of meat (and possibly fatty liver) atop a giant hearty salad. But it’s not like Bordeaux reds are the only fit: just about any earthy, brawny, somewhat rustic red Burgundy can do as well. Think Gevrey and satellites like Marsannay, Fixin; just don’t blow your lacy, aged Chambolle or subtly spiced Vosne on this. Here’s your recipe: keep in mind you have “thickening” fyxins like hard boiled egg, foie gras or avocado, and the indispensable duck breast slices, and then you have “core” healthy elements like the salad leaves and tomato. You’ll want to balance the thickening elements — don’t use them all! Use like three maximum fyxins. You could even put in a cooked, sliced potato as a thickener if you wanted (just slather it in dressing). Hard boil your egg if using. Drain and rinse mushrooms with fresh water if you found glass jar mushrooms without garlic and other seasoning, or chop your mushrooms into bite size pieces. In a big salad bowl, prepare the dressing with mustard, salt, pepper, sherry vinegar and oil. Add pepper to taste after the oil. Add the salad to that very bowl and mix. In a skillet, heat the duck fat, add the chopped shallot then brown and add the mushrooms (either glass jar or fresh). Brown all that a few moments. Add salt and pepper. On each plate, place a few leaves of salad, tomatoes and other fyxins, add mushrooms, and slices of smoked duck. If being extravagant, toast the slice(s) of bread. Place a slice in the center of each plate and add a slice of foie gras on top. Otherwise, substitute avocado slices without bread. All the same, don’t tell me you wouldn’t eat that delicious heart attack salad. That video is totally ridiculous. She just keeps adding meat! I want to go to her gites so bad. I love that she says you can eat it as an aperitif. Any idea who exports duck necks or foie gras stuffed duck breasts from France? Incidentally, the only one of these duck products I could find in Manila was the gesiers confits. [Well actually, of course I can find foie gras, but I can’t bear the thought of adding it as one of many ingredients in a salad.] In any case, your article gave me the inspiration to do one of these ridiculous meaty southwest salads – and it was awesome! I did gesiers,duck-fat-sauteed potatoes, apples, and an apple cider vinaigrette. Paired it with a very minerally Chateauneuf du Pape – and it worked perfectly together. Nice! Let’s hear it for meat salads making healthy green leaves play nicely with red wines! I just had this salad in Paris and it was served with a confit leg of duck, the beautiful red smoked duck breast, and the gesiers. Confit! Wow, that’s unorthodox. That’s really heavy vs the traditional salad–so much duck fat! To me that’s a whole different beast. I often do a duck confit with sherry vinegar and blood orange vinaigrette salad to complement Enderle and Moll or Gevrey Pinot Noir, but I don’t think any of the landaise would approve that as a genuine salade landaise. Still, I’ll bet it was great.